NEW YORK, New York - With the Class of 2015 just about completely wrapped up and headed off to their respective campus of choice, and with 1/3 of the July 2015 evaluation period over as of last Sunday, it is time to move on to the Class of 2016. And, oh my, what a class it is. From elite guards, to top quality bigs. From sharp shooters, to uber-talented wings. The Class of 2016 is loaded. L-O-A-D-E-D. Did I say loaded? 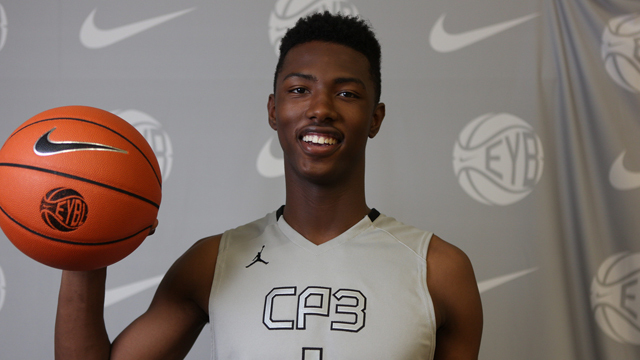 Tatum’s commitment, however, now leads us to believe that the currently ranked #1 player in the Class of 2016, PF Harry Giles (Wesleyan Christian Academy/Winston-Salem, NC), once thought to be more of a UNC lean, is now strongly considering joining his best friend Tatum in Cameron. Both have expressed a desire to team up together in college, and now with Tatum committing to Duke, already on Giles’ list, one cannot help but fawn over thoughts of a Tatum/Giles frontcourt taking the floor in the ACC in 2016-2017. There’s been no other word out of the Giles camp about where the mega-talent will commit, but he is rumored to be picking a school come fall. Kansas, UK, Ohio State, UNC, Syracuse, Wake Forest and UNLV all remain on his list, along with the new frontrunner, Duke. If there is one thing the Class of ’16 has plenty of, other than just pure talent, it’s top quality guards. I cannot recall a recent class with this much backcourt depth. 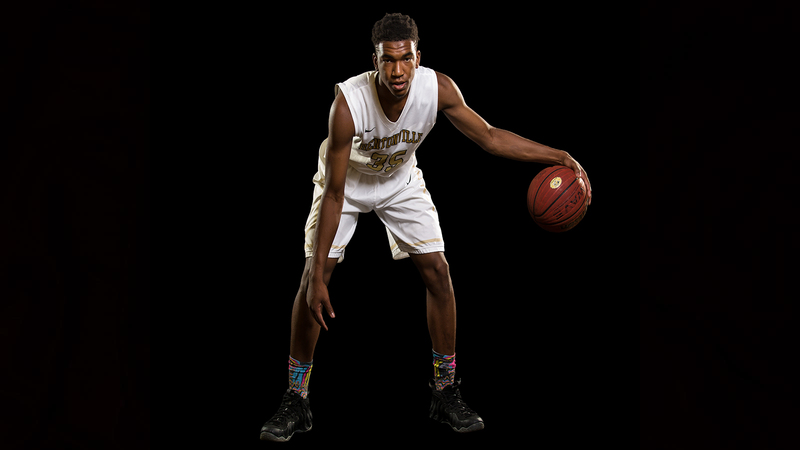 Let’s start with SG Malik Monk (Bentonville HS/Bentonville, AR). Widely regarded as the top two-guard in the country, Monk is a scoring machine, plain and simple. Coming off of another tremendous showing at the Nike EYBL Peach Jam, wherein he averaged 20.6 ppg, including a 31 point performance against Team Final, Monk is currently at the center of a recruiting war. And the battle is between the hometown Arkansas Razorbacks, and the mighty Kentucky Wildcats. Sure, there are other schools in the mix, Kansas, Baylor, UNC and Oregon to name a few, but this is currently down to an all-out, old school tug-o-war between the two SEC schools. We’ve had Monk headed to Arkansas for a long while now, as the close-to-home connection has been a big plus for Coach Mike Anderson and crew, who have had their sights set on Monk for a long time now. They have been recruiting him since day 1 and have made him their top priority that entire time. With that being said, however, never count out Coach John Calipari when it comes to recruiting 5-star players. Just look at the recent recruitment of Canadian export Jamal Murray. We had him signed, sealed and delivered to Oregon, per word from his inner circle, and Coach Cal came in at the last second and reversed the course. Same could happen with Monk, but for now, we’re calling him a Razorback. Who we are calling for Kentucky, however, is top tier PG Kobi Simmons (St. Francis/Alpharetta, GA). Long rumored to be a strong UK lean, we think it is only a matter of time before this smooth, 6’5” point guard makes it official. Simmons is a perfect fit for Coach Cal’s normal offensive style, who reminds me a lot – a lot – of John Wall. He’s silky and strong with a great handle and tremendous court vision, Simmons also possesses an uncanny ability to get into the middle of the lane and finish at the basket. Simmons can also stroke it from the outside. So while he’ll take official visits to Kentucky on August 28th and Xavier, where his former HS teammate Kaiser Gates is an incoming frosh, on September 4th – and maybe Ohio State after that – Simmons is a strong, to quite strong, future commit for BBN. Considered by many to be the crème-de-la-crème of the 2016 guards, PG Dennis Smith, Jr. (Trinity Christian School/Fayetteville, NC) is a special talent. At 6’1” and 173 lbs, he’s physically smaller than most of the other 5-star PG’s, but that doesn’t mean much in the grand scheme of things. Smith is virtually unguardable one on one and will flush it hard at the rim if you let him. He’s quick, strong, and heady with an outstanding handle, there is not much that he cannot do on the basketball court. That is why just about every program in the country is after him. Smith currently holds offers from Kansas, Duke, UNC, Miami, VCU, Florida, Wake Forest, NC State and, most recently, Kentucky. Thought to be headed to Coach Mark Gottfried and the Wolfpack of NC State, we think Smith will be a late commit and, well, anything can happen with late commits. Don’t be surprised if a couple of blood programs gain in momentum and are more in the picture come Spring of 2016. 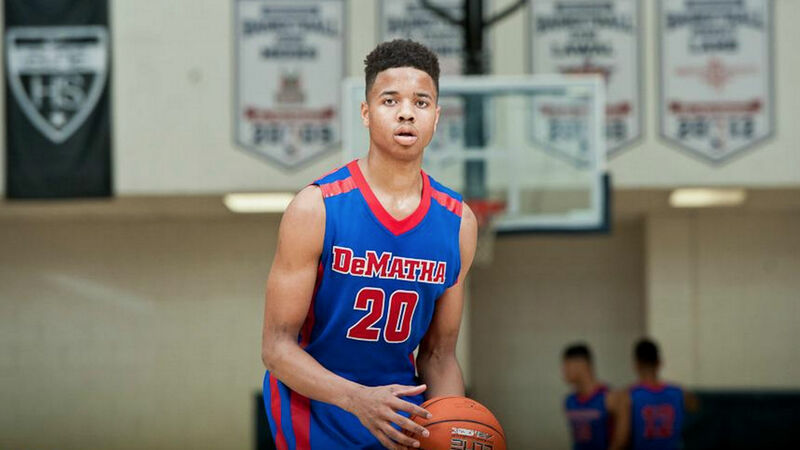 ​One of our favorite guards in this class has been SG Markelle Fultz (DeMatha Catholic/Upper Marlboro, MD). The 6’5” off guard has had, thus far, a spectacular Spring/Summer. We had him as one of our top players at the NBAPA Top 100 Camp in Charlottesville, VA a few weeks back, and he continued his dominant run last week at UA All America in Charlotte, NC. Along the way, the DeMatha guard has picked up recent offers from UNC and Kentucky, to add to his vast collection which presently includes Arizona, Louisville, Maryland, Kansas, UConn, Georgetown, Virginia, Texas and Florida State, to name just a few. With his play of late, more offers are sure to follow. This sleek, versatile guard handles like a true PG, but combines that with a vast repertoire of offensive moves not seen often by players this age. Fultz reminds us of DeMar DeRozan, but with a better perimeter game at this stage. Fultz’s step-back is lethal, as is his ability to create in both the set offense and in transition. Not many had this young man on their top tier radar a few short months ago, but with the way he has been playing of late, against the best players in the country, you can bet he’ll be right up there with any other guard in the Class of 2016 when it is all said and done. As far as his recruitment, it seems to be wide open at this point. Although he had mentioned at one time that Kentucky was his “dream school,” he has since backed off of that statement, clarifying what he meant was that Kentucky was his dream school when he was younger in that he always used to watch them and that they were the best team at that time. Take what you want from all of that, we have no information that Fultz is leaning in any particular direction at this time. Like we already said, his star continues to rise and whichever school is lucky enough to land this talent is in for a real treat once he steps onto campus. PG De’Aaron Fox (Cypress Lake HS/Katy, TX) is another uber-talented guard that has been destroying his competition as of late. At 6’3” and 165 lbs, the crafty lefty is about as quick as you will ever see on a high school basketball court. He has a lightening fast first step which leaves most defenders a couple of feet behind before they even realize it. And if you try and play off of him, to combat that explosiveness, he will drain it. Fox has no problem pulling it from 2-3 feet behind the three point line. He is super athletic, which is evident in the way that he uses his body and quickness to gain entrance into the paint, take contact, and finish at the rim. He currently has a host of SEC and Big 12 offers, and is rumored to be down to Kansas, Louisville and his home school, Texas. New Longhorn head coach Shaka Smart has been making Fox a numero uno priority since he arrived on campus, but do not be surprised if both Kansas and Louisville gain some ground and are still there at the end vying for this young man’s services. Another spectacular guard in the Class of 2016 that has been bursting on to the scene as of late is PG/SG Frank Jackson (Lone Peak HS/Alpine, UT). Jackson was probably the best guard at the NBAPA Top 100. At 6’3” and 185 lbs, Jackson is a bit small to play two-guard, but know one thing about him: he is a scoring machine. Whether he’s draining it from 23’ away, or crossing over some helpless defender on his way to the rim, Jackson seems to invent ways to put the ball in the basket. He possesses a death-dealing handle which will certainly aid him should he decide to play PG in college. He does see the court well and knows how to get his teammates involved, so a transition should not be a problem, if needed. But Frank Jackson’s true talent is scoring, so playing him off of the ball and having him come off of double and triple screens, as well as creating from the top of the key, will be where he is best utilized. A host of programs are involved now, including his home state schools Utah and BYU, as well as some big boys in Duke, Arizona and Maryland. The twist here is that Jackson is a Mormon and that may play a factor into where he eventually ends up playing college basketball. Remember, Jackson was verbally committed to BYU before retracting that back in December and opening things back up. Another factor weighing in is that he may take a Mormon retreat prior to attending college. With the accolades and attention he has been garnering as of late, it will certainly be interesting to see what Jackson decides to do. Time will only bring more offers from more big time programs. Expect to see the likes of Kansas, UNC and maybe even Kentucky getting involved at some point if Jackson stays uncommitted, which he may not. Duke is considered to be the strong leader here at this point and it is rumored that the Blue Devil staff is pushing hard for a commitment from Mr. Jackson. And that may come sooner rather than later. ​New York City has been the home of many great guards over the years. That tradition continues with SG Rawle Alkins (Christ the King/Brooklyn, NY). The 6’4” off guard reminds us a lot of another former Brooklyn phenom by the name of Lance Stevenson. Alkins has a very similar body-type and style of play to Stevenson, except Alkins is a much better shooter at this stage. Alkins uses his big frame to attack the rim with a reckless abandon, but he also has no issue with drilling the deep three, making him a very dangerous player to guard on the floor. Alkins was incredible last week at the Adidas Gauntlet, scoring at will at times for his New York Rens. He is another top tier recruit with a plethora a major offers, including Indiana, Kentucky, Maryland, Cincinnati, Kansas, Florida, Louisville, Texas, St. John’s and Villanova. Kentucky is currently high on his list, but new St. John’s coach Chris Mullin is pulling out all of the stops to keep this local stud close to home, calling Alkins immediately after he was named the new coach. Expect an Isaiah Briscoe-type of recruiting battle here between the Johnnies and UK. We are going to wrap up all of this guard talk with a couple of guys that are both verbally committed to Coach Tony Bennett and the University of Virginia Cavaliers, PG Ty Jerome (Iona College Prep/New Rochelle, NY) and SG Kyle Guy (Lawrence Central HS/Indianapolis, IN). Playing alongside each other at the NBAPA Top 100 Camp a couple of weeks ago, Cavos fans got a sneak peak of the future of Virginia Basketball watching the pair play on their soon to be home floor. And know this, Jerome and Guy were two of the top players at the camp. Jerome, at 6’5” and 180 lbs, is a big, silky lead guard with a very high basketball IQ, deep shooting range, and a knack for setting the table. His future backcourt mate, Guy (6’2” and 165 lbs), is a lights out shooter who is in range as soon as he gets off of the bus. This tandem destroyed opponents all week at the NBAPA Camp, and will soon start destroying the ACC. Good times ahead for UVA. ​As for some of the big guys in the 2016 class, you have to love watching PF Omari Spellman (MacDuffie School/Middletown, NY). You especially have to love him if you are a Villanova fan, where Spellman is currently committed. The 6’9” and 275 lbs power forward is a perfect blend of power, finesse, and athleticism which should have Wildcat fans very, very excited. He was an animal at the NBAPA Top 100, clear and away one of the top interior performers. He has great feet, deceptive back to the basket moves, and a sweet perimeter stroke. He reminds me of UNC’s Kennedy Meeks, except a better shooter. Coach Jay Wright and crew are getting a good one here. And if they can convince incoming frosh PG Jalen Brunson to stay longer than one year, he and Spellman will make a lethal inside/out combination. If SF Miles Bridges (Huntington Prep/Flint, MI) were not in the unfortunate position of being in the same class as Jayson Tatum, Harry Giles and SF Josh Jackson (Prolific Prep/Southfield, MI), he would garner more national attention as a top wing prospect. Bridges, at 6’7” and 225 lbs, has the ability play both the small and power forward positions, depending on what is needed, but he excels on the wing, where he can slash to the basket and create chaos along the way. His perimeter game is not exactly thrilling, but he can knock down the three at times. He likes to get physical inside, and he loves to finish strong. This is currently a battle between Kentucky and Michigan State for his services, with the Wildcats thought to be the current lean at this time. Coach Tom Izzo, however, is not giving up, as he has been scene on the sidelines watching Bridges recently at both the NBAPA Top 100 and at the Peach Jam last week. The Spartans coach is currently working on a phenomenal ’16 class that already includes C Nick Ward (Lincoln HS/Gahanna, OH) and, more recently, SG Josh Langford (Madison Academy/Huntsville, AL). It may take a divine intervention, however, to pull Bridges from the grasp of Calipari. Word is Bridges will eventually be a Wildcat.